FILE - Facebook logo is displayed in a start-up companies gathering at Paris' Station F, in Paris, Jan. 17, 2017. The social networking giant — with nearly 2 billion users, or about 25 percent of the world's population — said it has agreed to provide maps to UNICEF, the International Federation of the Red Cross and Red Crescent Societies, and the World Food Program, the food-assistance branch of the United Nations. "We are excited about this," said Toby Wicks, a data strategist at UNICEF. "Facebook has vast amounts of data." The company will provide maps of data in the aggregate. No Facebook user will be identified, the firm said. 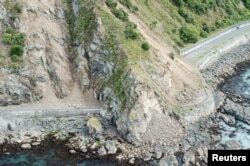 FILE - Landslides block State Highway One near Kaikoura on the upper east coast of New Zealand's South Island following an earthquake, Nov. 14, 2016. Facebook created maps after the earthquake to show where people were going in the days after the quake struck. After a disaster, "the first thing you need is data, which is extremely scarce and perishable," said Molly Jackman, a public policy manager at Facebook. But Facebook, particularly in areas with a high concentration of users, can "present a more complete picture of where people are," she said. Facebook will offer the organizations three types of disaster maps that will be updated as frequently as possible. Facebook's location density maps show where people are located before, during and after a disaster. In addition to using satellite images and population estimates, these maps also draw from Facebook users who have their location data setting turned on. Facebook's movement maps show how people move during and after a disaster, and can help organizations with directing resources. For example, Facebook created maps after the 7.8-magnitude earthquake in Kaikoura, New Zealand, last year to show where people were going in the days after the quake struck. Facebook's Safety Check maps are based on where Facebook users are when they use the firm's Safety Check service to tell friends and family they are safe. Facebook will create maps showing areas where people are declaring themselves safe and where help may be needed. FILE - A screenshot of a Facebook Safety Check page is shown from Nigeria. For example, after a disaster, "we might know where the house is, but we don't know where the people are," said Dale Kunce, global lead for information communication technology and analytics for the American Red Cross. "Our first reaction may be to go to where the devastation happened," Kunce said. "But maybe most people are 10 miles away, staying with families when they reported they were safe. So the place to go may be where they are. We're excited to see what the possibilities and potential are." Wicks, of UNICEF, said the partnership is at the beginning stages, but daily snapshots of where populations are have the potential to help his organization with disaster planning. For example, knowing how close people are to a health facility and how long it takes for them to travel to a medical clinic can help with decisions such as where to deploy medical services in case of a disaster. The data maps will be most helpful in places where internet connectivity is high and in regions with a lot of Facebook users, Wicks said. "Are these data representative of the populations we are trying to serve?" Wicks asked. "That's the key question." Facebook said that it intends to make it possible for other organizations and governments, including local organizations, to be part of the program.